Surprise and impress your customers and win new ones with this compelling alternative to PVC scrim. At 180 g/m2 (5 oz. 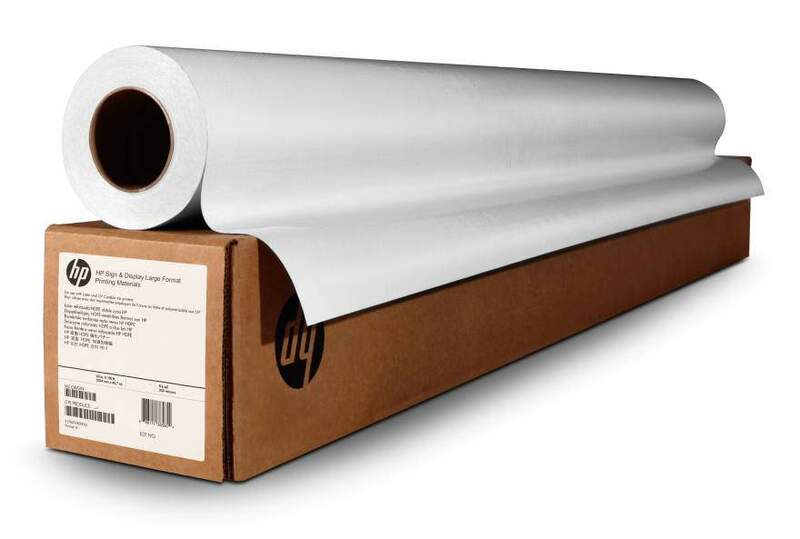 ), HP HDPE Reinforced Banner offers the image quality, durability, and tear strength of standard 440 g/m2 (13-oz.) vinyl. Optimized with HP Latex Inks and using proprietary HP media technology, you get the ideal solution for your retail needs, signage solutions, and street pole banners. And it's recyclable through the HP Large Format Media take-back program. Impress your environmentally conscious customers with a recyclable alternative to PVC scrim banner. Achieve the performance of PVC at less than half the weight. And see how you can reduce costs and create potential for new business, new profit.Challenge your signage to the rough-and-ready demands of outdoor banner display. This versatile, lightweight material produces a smooth finish, offers the tear strength of 440 g/m2 (13-oz.) PVC scrim, and it's temperature and water resistant.See how your business can benefit. Using proprietary HP media technology, HP HDPE Reinforced Banner is optimized with HP Latex Inks to give you a compelling alternative to PVC scrim, and to produce the consistent, reliable performance you expect.